Tomorrow is officially the first day of Summer! I’m hopeful that with the season changing from Spring to Summer, all this rain we’ve been having will come to an end. Fingers crossed… But I’ve kept my spirits up by telling myself that all the plants and flowers are doing wonderfully this year because of all the rain. Silver lining, right? I’ve also managed to keep in a positive mood with taking advantage of the brief moments of sunshine we’ve had, and this fun little pink and white summer tablescape certainly helped as well. 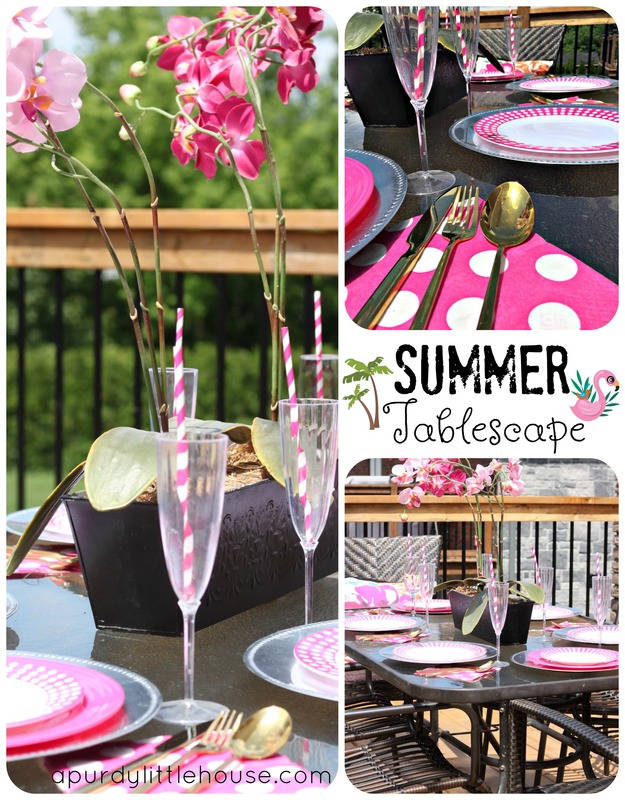 To celebrate the Summer Solstice, six other bloggers and myself teamed up to bring you 7 unique Summer Inspired Tablescapes. We all have a passion for tablescaping and I love all the different styles and each individual’s take on a classic Summer Tablescape. A big thank you to Kelly from North Country Nest for hosting this hop. 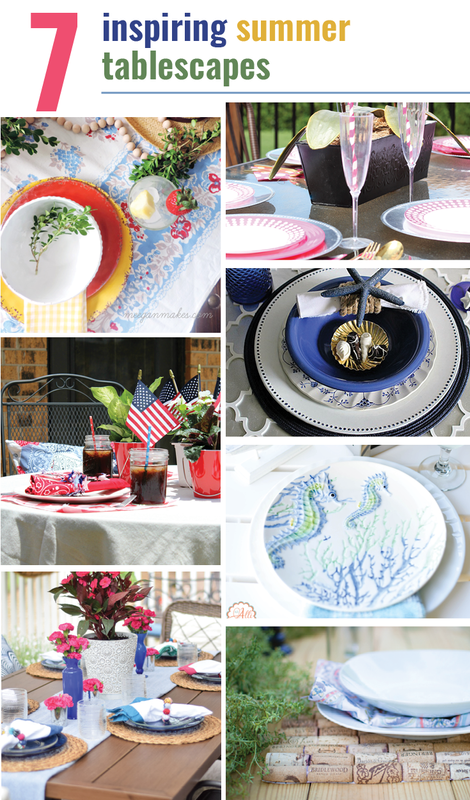 Be sure to check out all the amazing table settings my blogging friends have been working on. 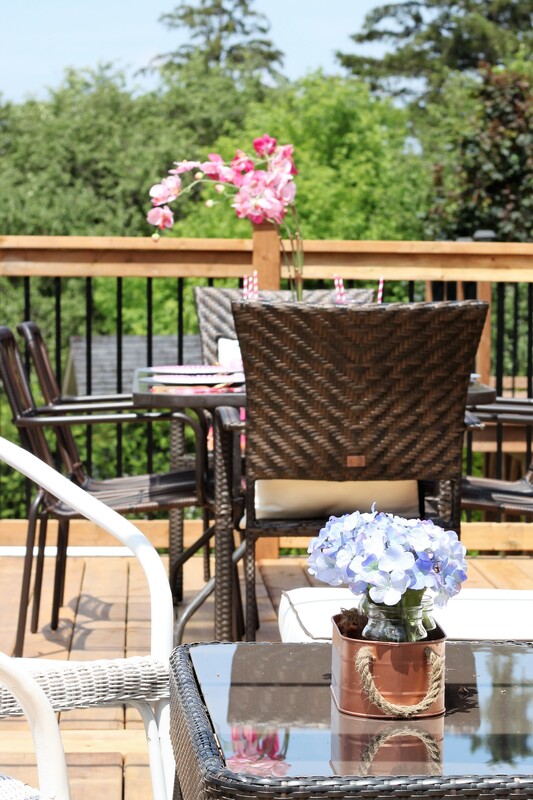 When I think of Summer, I think of blooming flowers in shades of pink and crisp white. 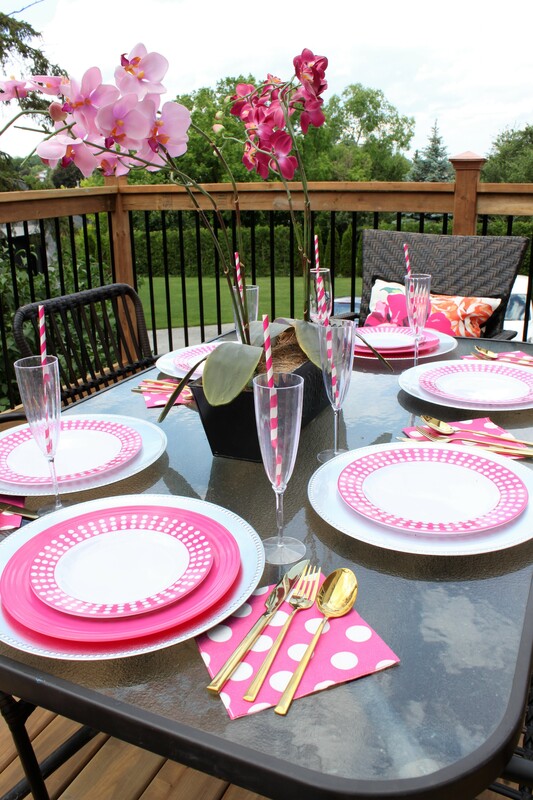 These colours inspired my vision of a Summer tablescape . I’m not a great gardener. Mediocre at best, so faux flowers are my friends… and I’m not ashamed to admit it. Lol. 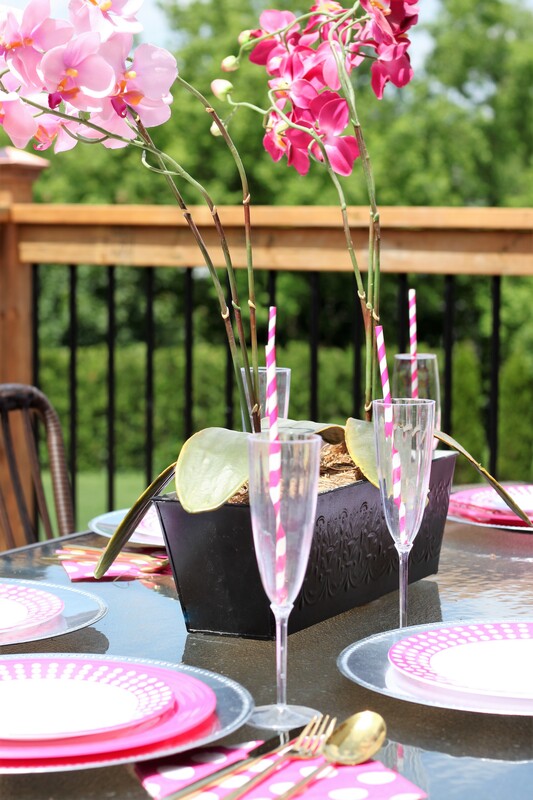 These faux orchids set the stage for my pink and white table. 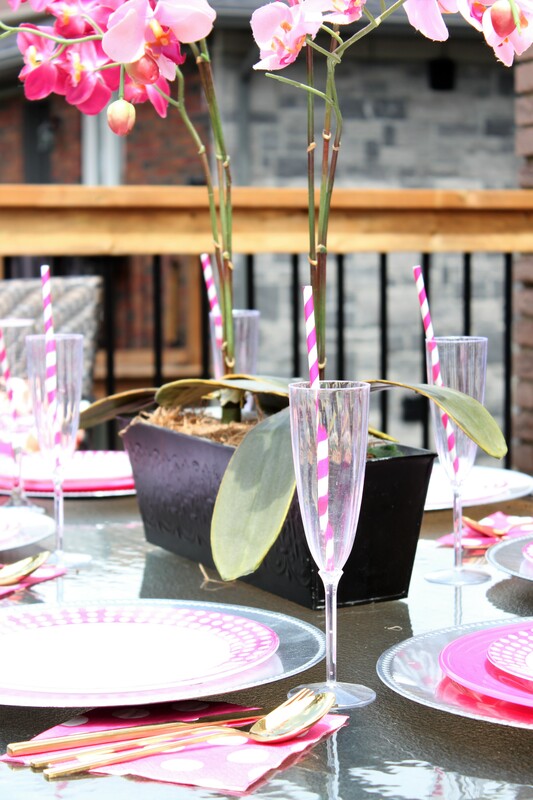 I love to add something playful into every tablescape, and these striped paper straws from the dollar store did the trick. I also found these polka dot paper napkins, which add some whimsy. 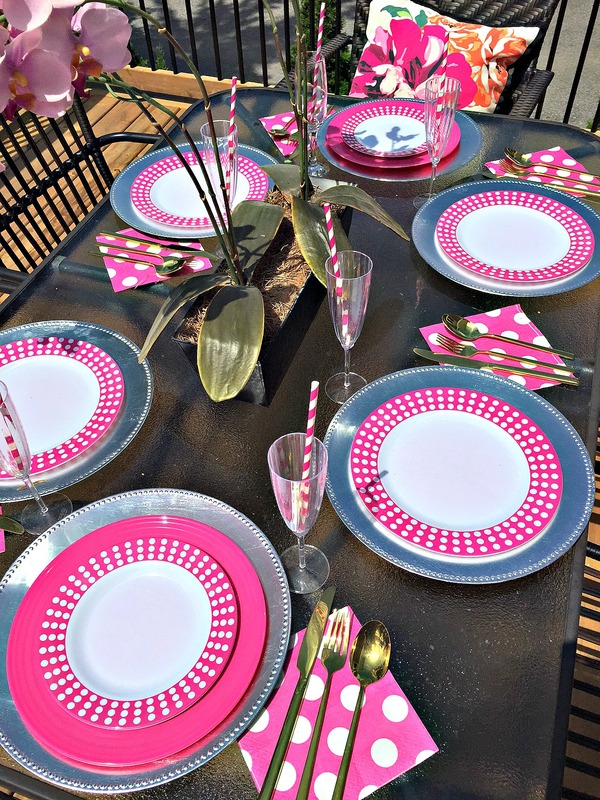 I grabbed some pillows from my living room to help ground the table and add in more pink. For my birthday a couple months back, I bought myself a gift that I’m obsessed with. It’s this set of gold flatware. Forget jewellery as a gift… I want housewares! And the flatware is kind of like jewellery for a tablescape, right? 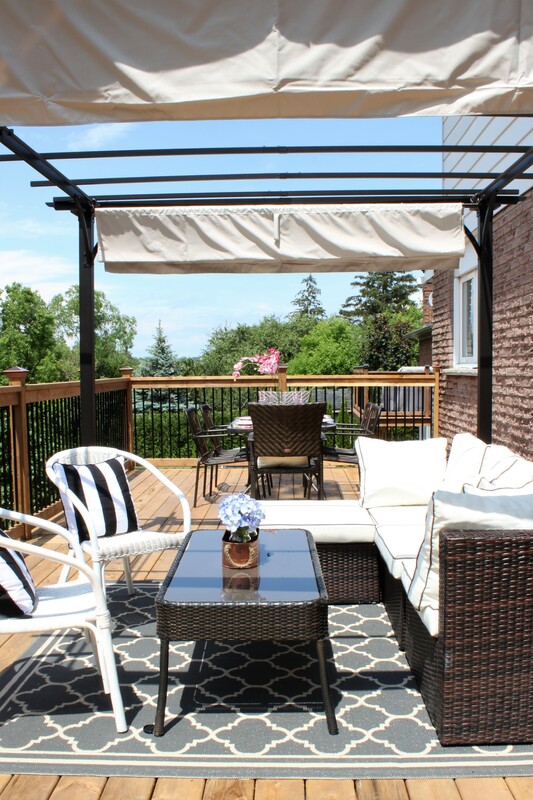 I’m so happy that my balcony deck is finally completed. We waited nearly a year to have this done, and I’m thrilled with the final results. I’ll be doing a more thorough reveal of this space in the coming weeks, but for now, you can check out some sneak peeks of it. Make sure to follow me on Instagram to see more pics of this space coming together. I still need to add in more decorative accents to the space, but you get the general idea. 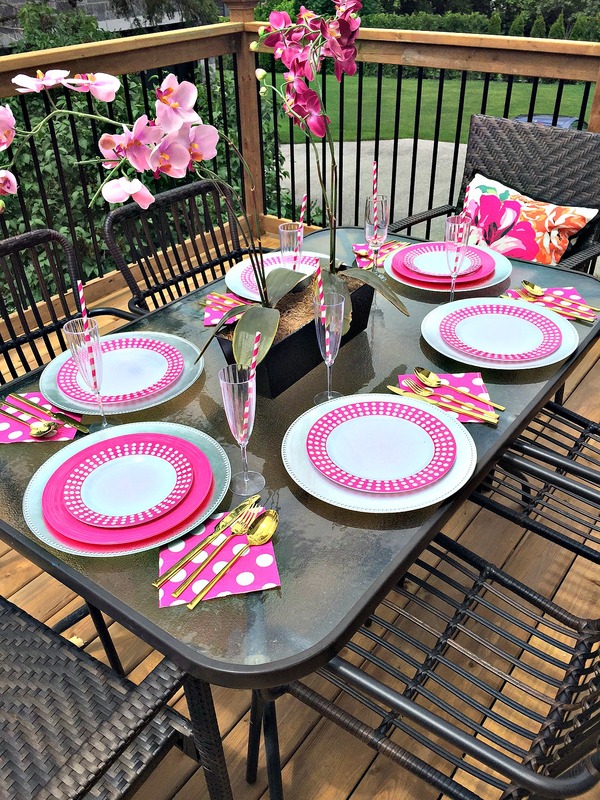 These melamine outdoor plates were purchased at the dollar store and I love to use them whenever we eat outside (which is any time it’s not raining). Very classic, cosey, and inviting, I’ll be there soon. Melamine? Really?!?!? I ventured over here from Pinterest because of those plates. (Pink is my favorite color, and I loved the pattern.) I thought they would turn out to be Kate Spade or something equally high priced. OMG!!! Those are cute as a button! And as for the orchids, great job. Never would have guessed them to be faux. It’s always good to have really convincing fakes. I use them occasionally for tablescapes (often mixed in with real for fullness without the expense), and good ones really get the job done. 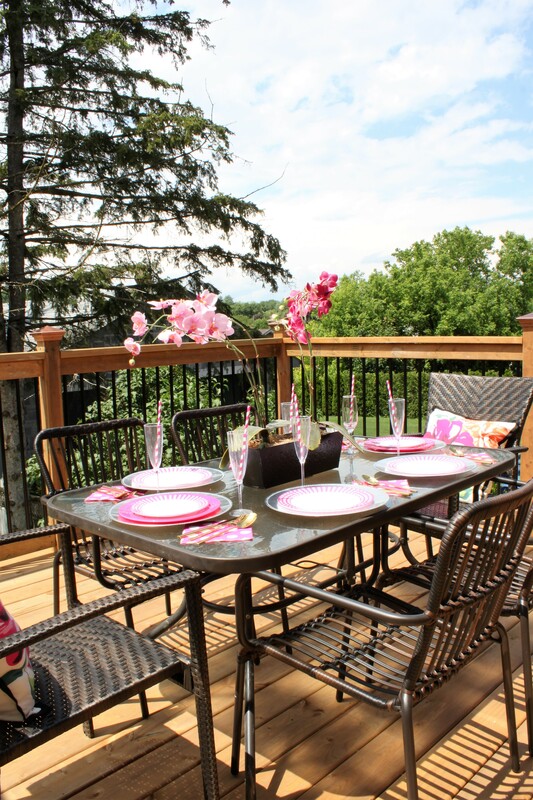 Congratulations on your new deck. I wish you many years of enjoyment! 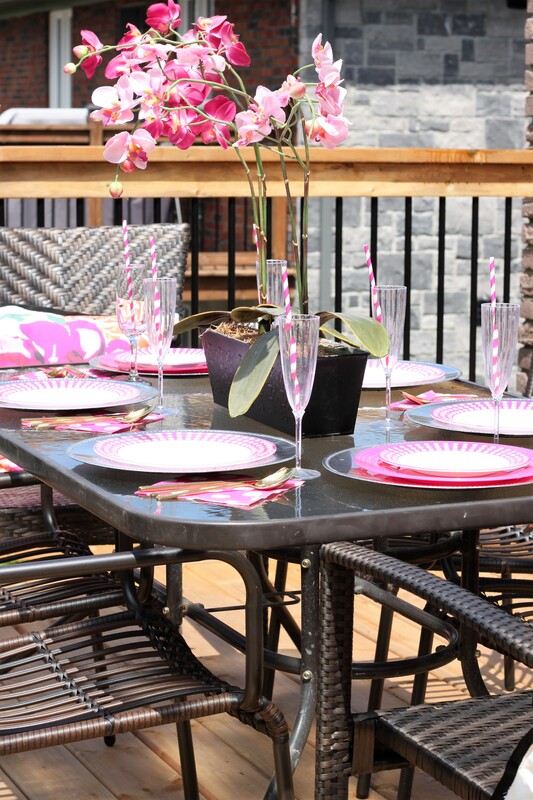 You’re in great company in enjoying faux flowers – I have a black thumb and an still working on not killing off everything in my garden 😉 I love all the fun pops of pink and the different patterns you used – absolutely beautiful! 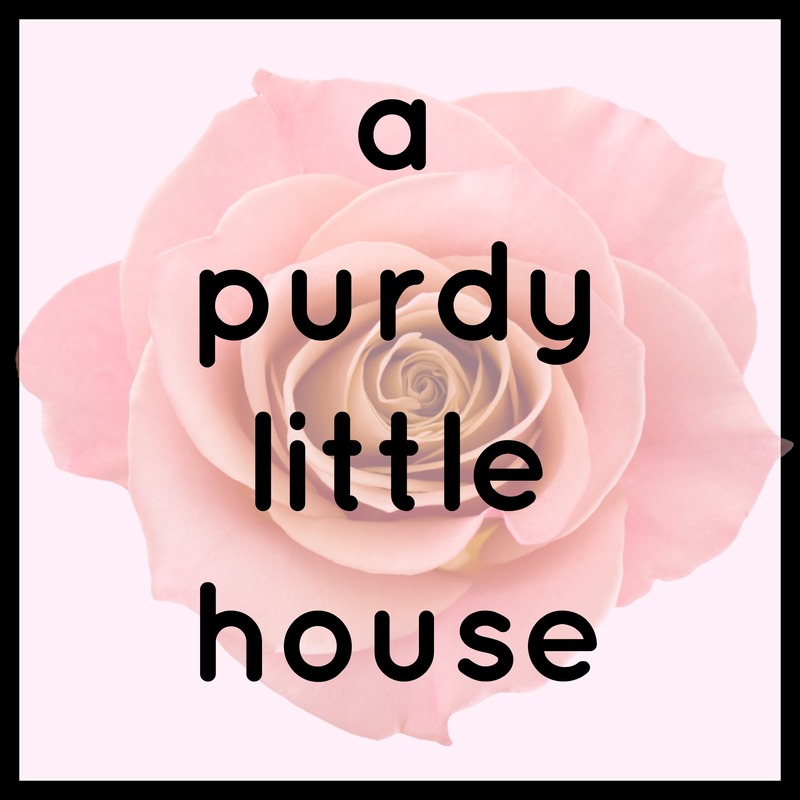 Thank you so much for joining in on this blog hop! Hi Sue! You have the cutest ideas! 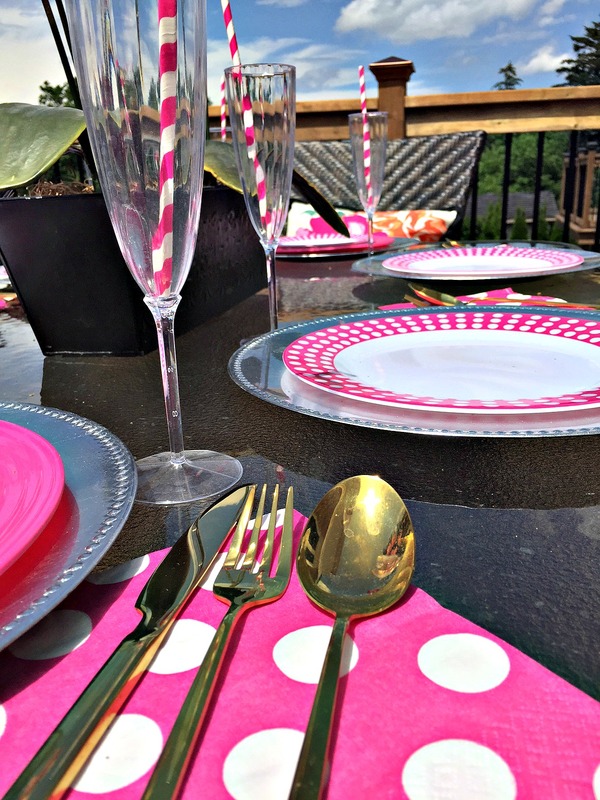 The pink and white plates and the darling striped straws are so fun! I can’t grow anything-so faux it is in my house, too. AND they look as lovely as can be. 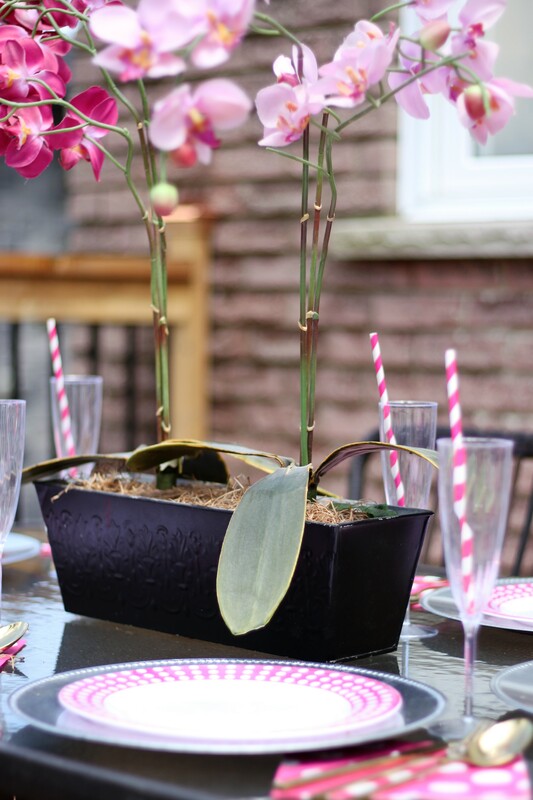 The perfect centerpiece for a lovely table. Thanks for sharing. You are really talented in everything you do. It was wonderful to visit your blog today.